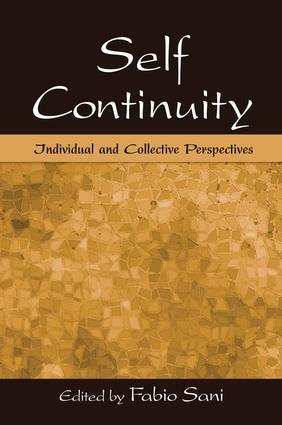 This volume is the first to bring together the fast-growing research on self-continuity from multiple perspectives within and beyond social psychology. The book covers individual and collective aspects of self-continuity, while a final section explores the relationship between these two forms. Topics include environmental and cultural influences on self-continuity; the interplay of autobiographical memory and personal self-continuity; the psychological function of self-continuity; personal and collective self-continuity; and resistance to change. The volume is rounded off with commentaries on the central issues and themes that have been discussed. The book provides a unique sourcebook for this important topic and will appeal not only to upper-level students and researchers in social psychology, but, in view of the multiple perspectives represented in the volume, it will also appeal to cognitive, developmental, and personality psychologists. “Know Thyself!” … But What, How, and Why?